“The days of calling netball a non-contact sport are well and truly over,” says sports podiatrist and founder of A Step Ahead Foot + Ankle Care Dr Brenden Brown. He says netball is not only physically demanding, it’s a high-impact sport in which foot and ankle injuries are rife (particularly if players aren’t wearing appropriate footwear!). Do players really need new netball shoes every season? “Netball involves lots of twisting on one foot, side to side motion, jumping and running—as a consequence, many players get ankle sprains. Having a new pair of shoes at the beginning of netball season is essential. It’s an injury-prevention no-brainer! “Good quality netball shoes go a long way to assisting with injury prevention. 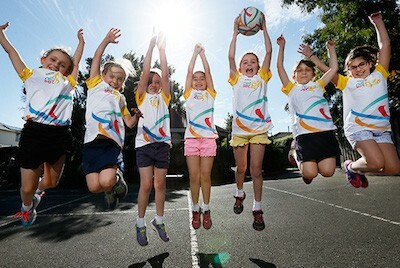 I witness this time and time again…I’m a netball Dad and when I see a child on the sideline with an injury, it’s universally in a poor shoe,” says Dr Brenden. Regular runners vs netball shoes: what’s the difference? Mark Doherty, ASICS general manager of product, knows a thing or two when it comes to sports shoes. He explains that the sole of a netball shoe is a lot different to that of a running shoe. “We tend to use solid rubber in the soles of our netball shoes, whereas in a running shoe we use blown rubber which is an air injected rubber. “While we want netball shoes to be lighter and lighter, we also need to make sure they last and offer the wearer the protection they require. “Solid rubber has the ability to wrap around the shoe and it also stabilises the shoe so that when you go into cross-lateral movements there’s the solid platform you need. What makes a great netball shoe? “When choosing a netball shoe consider cushioning, stability, support and weight (you want it to be lightweight). A firm heel counter is important and there should be minimal twisting or ringing out of the shoe,” says Dr Brenden. Mark says the basic principle is that a netball shoe should have a more stable base than a running shoe, but it’s also important to consider durability and performance of the shoe to last longer. Are new designs just marketing hype? “We have a couple of top shoe models that we change every two to three years, based on the latest technology. This might allow us to make the shoe lighter, more durable or more flexible,” says Mark. “For 2018 ASICS’s introduced the new Netburner Professional with an updated midsole foam that’s much lighter than any foam we’ve ever developed before. Final note: It pays to get professional advice when choosing a netball shoe. “When you’re buying a sports-specific shoe, it’s a great idea to get professional advice. “If you’re someone with a really high arch and you select a shoe that’s designed for someone with a low arch you are VERY likely to increase your risk of injury,” says Dr Brenden. “Shoes differ from season to season—for example the Netburner Professional has a new, more flexible, upper material this year—which can change the feel of the shoe. “But also, a shoe is like a fingerprint; because of the amount of manual labour involved, no two shoes are the same,” says Mark. A Step Ahead Foot + Ankle Care is one of Sydney’s leading foot and ankle clinics. Principal podiatrist and founder of A Step Ahead Dr Brenden Brown (AKA Dr Foot) has been taking care of people’s feet for more than 20 years. With a background in sports medicine and having served as a former president of the Australasian Podiatry Council, Brenden is a wealth of information when it comes to foot and ankle care.